Today, I'm contributing to Kim Klassen's, The Inspiration Studio. the curious character in these images. Wishing you an inspiring and creative week! Linking at The Inspiration Studio and Macro Monday. Love the frog peeping over the edge and the soft mossy bank below. The ring round the eye is a jewel in itself. Incredible images!!! You've rendered this little frog sweet and adorable! Wow two great photos! Excellent composition! Beautiful and great macros! I am impressed! These are wonderful. I adore frogs so I had to check yours out. Love the moss, the wetness of the grass and that frog looks awesome. Such perfect shots! Love the moss in the composition, and the little frog wearing a leaf between his eyes. 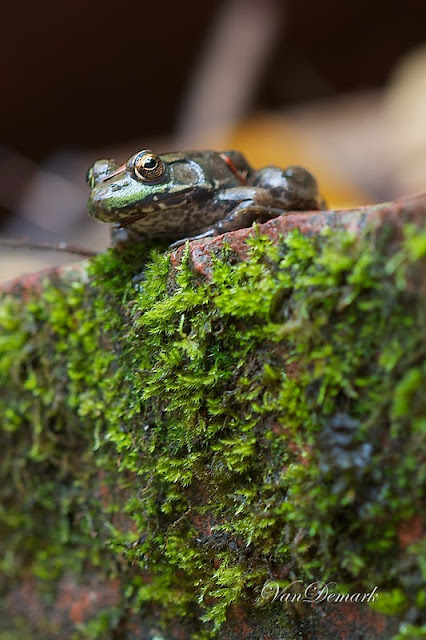 Great composition ... love the moss and the frog's coloring and eyes. Love, loved your post - really made me stop and think. The eyes look like they are made of gold, fabulous capture. Linking over from Macro Monday. Oh lovely! I just love these photos especially the first one. I've always been intrigued with little eyes and moss and you captured wonderful details. Anna, thank you for your caption contribution. It has been posted. 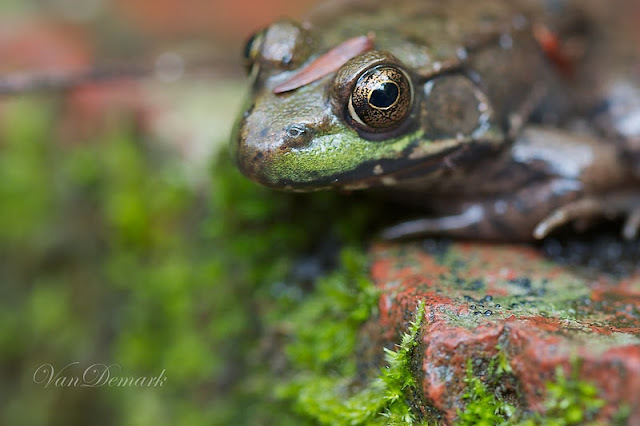 What a wonderful portrait of a frog. Gorgeous. What a cute little fella, and that second image is perfection Anna! This would have to see my girlfriend, which she loves frogs. I'll just send her your link so they can see themselves here. Oh Dear Anna it's an incredible image!Excellent like always! I love the deep green-ness of these shots. One can almost feel the dampness from the waterfall while looking at this cute little guy.